It's September 1st, Labor Day, and besides an afternoon of barbecue and family it is also a time when every Major League team expands their roster. This afternoon, as reported widely on the 'net, the Dodgers have called up several players. They include Alexander Guerrero, Tim Federowicz and Chris Perez (who returns from a rehab assignment). 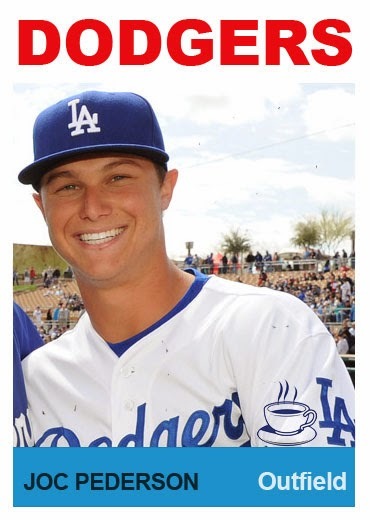 Furthermore, coming up to the Dodgers for the very first time in their professional careers are star outfield prospect Joc Pederson and righthanded reliever Yimi Garcia. UPDATE: Per a Dodgers press release, Carlos Triunfel has been designated for assignment to make room for Joc. Joc Pederson is probably the most anticipated call up of the bunch. He is considered to be the Dodgers top minor league prospect, and will likely have the eyes of the world watching every step he takes. He is a lefthanded slugger with five legit tools. He can hit for average, hit for power, has excellent speed on the basepaths, has a great defensive centerfield game and a solid arm strong enough to cause baserunners to think twice. It should be exciting to see if he can move his game to the Major League level. Unfortunately, you shouldn't expect to see him play much this month, but he'll surely get a bit more than just a cup of coffee. Yimi Garcia is a righthanded reliever who has recorded some impressive Minor League numbers. This season in Albuquerque he struck out 69 while only walking 18. Last year, while in Chattanooga, he did even better. He struck out 85 and walked only 14 batters. His best pitch is clearly a slider that he uses to punch batters out. BTW, it has been also been reported by Pedro Moura of the OC Register that Carlos Frias, Miguel Rojas and Erisbel Arruebarrena will be called up to the Dodgers tomorrow. So, stay tuned for confirmation of that later on. 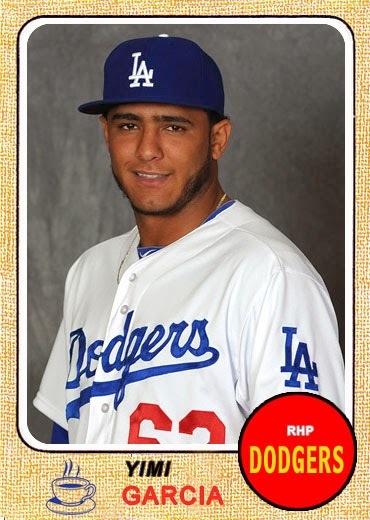 In celebration of Joc's and Yimi's promotion to the Dodgers I made the above fantasy cards for them. I used photographs grabbed from Jon SooHoo's photog blog and both the 1964 and 1968 Topps Baseball card designs. The Los Angeles Dodgers today recalled catcher Tim Federowicz (#26), right-handed pitcher Yimi Garcia (#63) and infielder/outfielder Alex Guerrero (#7) from Triple-A Albuquerque and selected the contract of outfielder Joc Pederson (#65) from Albuquerque. The club also reinstated right-handed pitcher Chris Perez from the 15-day disabled list (bone spurs, right ankle) and designated infielder Carlos Triunfel for assignment. Federowicz has appeared in 18 big league games in two stints with the Dodgers this year, but tore up the Pacific Coast League with a .328 batting average, 26 doubles, 14 homers and 48 RBI in 78 games with Albuquerque. The 27-year-old posted a .297 batting average with runners in scoring position (22-for-74) for the Isotopes this season. Garcia, 24, will be making his Major League debut after going 4-2 with five saves and a 3.10 ERA in 47 appearances with Triple-A Albuquerque. He limited right-handed hitters to a .200 batting average (28-for-14) and posted a 2.84 ERA (6 ER/19.0 IP) in 14 games after the All-Star break. The native of the Dominican Republic is in his sixth professional season after being signed as a non-drafted free agent on Jan. 29, 2009. Guerrero will be making his first appearance on the big league roster since appearing in both games Down Under during MLB's Opening Series in Sydney. The 27-year-old hit .329 with 15 homers and 49 RBI in 65 games with Albuquerque, including a .356 batting average with runners in scoring position (26-for-73). Pederson, who is making his first appearance on the Major League roster, was honored as the 2014 Pacific Coast League Most Valuable Player, the league's Rookie of the Year and as an outfielder on the All-PCL Team, after becoming just the fourth player in the 112-year history of the Pacific Coast League to post a 30-home run/30-steal season. The 22-year-old batted .303 with 30 steals (T-7th, PCL), 17 doubles, four triples, 33 homers (1st, PCL) and 78 RBI in 121 games with Triple-A Albuquerque this year. Perez last pitched in a Major League game on Aug. 3 against Chicago-NL and made five rehab appearances with Single-A Rancho Cucamonga. Triunfel played in 12 games in five stints with the Dodgers this season, his first year with the organization. 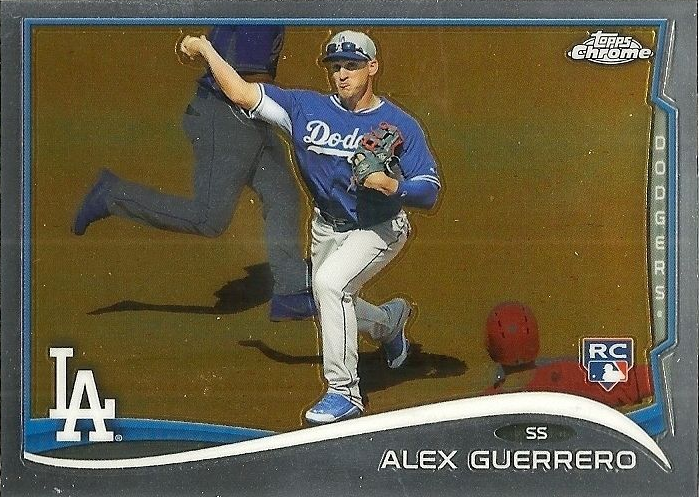 Topps released their 2014 Topps Chrome set last week, and I've got pics of all of the Dodger base cards to share with you. Check them out below. Go here for a complete checklist of the set. 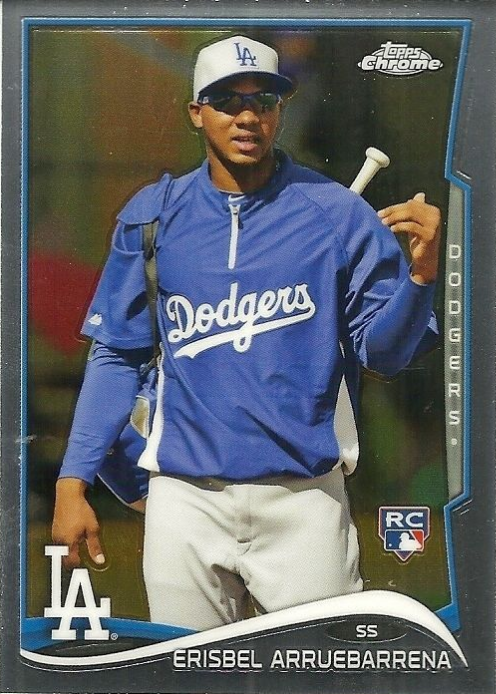 As you can tell, this set is just a super-shiny chrome version of the Topps Series 1 & Series 2 flagship Baseball card set, but it does include a new card for Cuban infielder Erisbel Arruebarrena. Of special note, there are a couple of new Dodger variation cards for Yasiel Puig and Hyun-Jin Ryu. You can see those at the very bottom. The Ryu card is especially funny. It shows Ryu goofing on BFF Yasiel Puig with a tap on the head with his bat. Hyun-Jin Ryu made a glorious return from the DL yesterday afternoon. He went seven strong innings, struck out seven, gave up only four hits and walked none. At one point he retired 14 straight Padres. His short stint on the DL may turn out to be fortuitous. He will likely be depended upon by the Dodger should they go deep into the playoffs, so a well rested Ryu will be important. 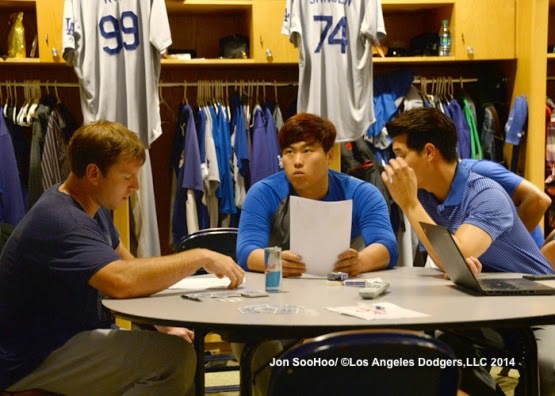 The photo above features Ryu preparing for the game with catcher AJ Ellis and translator Martin Kim, via Jon SooHoo/LA Dodgers 2014. Go here to check out more pics from Jon. The Dodgers offense finally woke up against the Padres. They mashed out twelve hits and scored seven runs. Both Adrian Gonzalez and Matt Kemp continued their hot-hitting ways. AGon had four hits and Kemp knocked out two; including the eventual winning run in the fifth inning. Juan Uribe, who also just returned from the DL, was sharp at the plate, as well. He recorded two hits and drove in two runs. Of note, Matt Kemp made a fantastic slide at home plate to score a run in the eight inning. On a wild pitch Kemp raced for home and avoided a tag by the pitcher to score. As Vin would say, "he looked dead to rights." But with a little bit of quick thinking and fast reflexes, Kemp found a way to touch the plate before getting tagged. Watch it below. The Dodgers maintain a 2.5 game lead over the Giants as they enter Labor Day. Things are starting to get serious. Now, check out some more links below. ICYMI: Go here to check out homestand information for tonights game against the Nationals. Via Ken Gurnick at MLB.com, "Haren likely to have next start pushed back." Dan Haren is still listed as the Dodgers' probable starting pitcher for Wednesday's game against the Washington Nationals, but there are indications it will instead be rookie right-hander Carlos Frias. He's likely to start on Friday. Bill Plunket at the LA Register notes that the Dodgers will be going to a six man rotation. This not only helps keep our big three arms fresh, but also allows us to audition a potential #4 pitcher should one be needed for a playoff run. Via Eric Stephen at True Blue LA, "Onelki Garcia begins rehab assignment, back on Dodgers' radar." "I've heard his name. We're running out of games down there, but he's a lefty," manager Don Mattingly said. "A lefty helps us, and Paco's a little bit away." The Dodger rookie ball club has made the playoffs. Via Brandon Hart at the Ogden Raptors, "Raptors Clinch Playoff Berth with Win." Their AA club also made the playoffs. Via Vince Lennon at WRCBtv.com, "Lookouts Clinch Playoff Berth." Check out who won Chucky. As you may know, Joc Pederson gave away his 1994 Buick Century to one lucky fan on Fan Appreciation Day. Puig can dance, but if only he could hit right now things would be great. Doh!